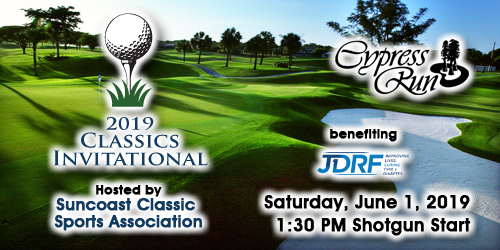 All proceeds benefit the mission of the Suncoast Classic Sports Association, the Juvenile Diabetes Research Foundation and finding a cure for Type 1 diabetes! IF YOU CAN'T JOIN US THIS YEAR, PLEASE CONSIDER A TAX DEDUCTIBLE DONATION TO FINDING A CURE FOR TYPE 1 DIABETES. JDRF AND SCSA THANK YOU FOR YOUR SUPPORT!